Bovine viral diarrhea virus can cause acute disease in livestock, leading to economic losses. We show that Prostaglandin A1 inhibits bovine viral diarrhea virus replication in Madin-Darby bovine kidney cells (94% inhibition using 5μg/mL). Light and electron microscopy of infected cells shows that Prostaglandin A1 also prevents virus-induced vacuolization, but at higher concentrations (10μg/mL). In pregnant cows, BVDV can reach the fetus and cause abortion, stillbirth or teratogenic defects, depending on the gestational period when infection was established.1 When the infection is established in the final period of gestation, calves can give birth to immunotolerant and persistently infected calves that are considered reservoirs of the virus.3 Also, the serum of infected animals may contain active BVDV viral particles, which may result in permanent infection in primary cultures and established cell lines that are routinely cultivated using bovine serum, in the laboratory. BVDV isolates are divided into the genetic groups BVDV 1 and 2, which are genetically related to a separate species, the BVDV-3 or Hobi group,6 which was initially identified in fetal bovine serum from Brazil.7 BVDV isolates are also classified into cytopathogenic (cpBVDV) or non-cytopathogenic (ncpBVDV) depending on their ability to cause cytopathic effect in cell culture.3 Birk et al.8 showed that cpBVDV induced extensive vacuolization in Madin-Darby bovine kidney (MDBK) cells; however, this phenomenon appeared morphologically different from that observed in apoptosis and necrosis. Prostaglandins are natural eicosanoids secreted by a variety of human tissues and capable of causing profound and diverse physiological effects at very low concentrations. All eicosanoids function locally at the site of synthesis, through receptor-mediated G-protein linked signaling pathways. Prostaglandin A1 (PGA1) is capable of blocking the replication of a wide variety of RNA and DNA viruses, including CSFV.9–11 Despite the importance of BVDV for animal health, the effect of PGA1 on BVDV replication has not been examined. Therefore, we evaluate the effect of PGA1 on the replication of cpBVDV in MDBK cells, focusing on changes in BVDV-induced vacuolization. MDBK cells were cultured in vitro in Dulbecco Modified Eagle Medium (DMEM), supplemented with 10% BVDV-free fetal bovine serum (FBS, Gibco), penicillin (500U/mL), streptomycin (100μg/mL) and amphotericin B (fungizone, at 2.5μg/mL). Monolayers of MDBK cells were infected with cpBVDV-1 (NADL strain) at a multiplicity of infection of 0.1. Viral particles were allowed to interact with host cells for 1h in the absence of FBS, and then the supernatant was replaced with complete growth medium containing 0.1, 1, 2.5, 5 or 10μg/mL Prostaglandin A1 (PGA1, Sigma Chemical Co.; stored as a 1mg/mL solution in 100% ethanol). After treatment of monolayers with PGA1 for 36h, culture supernatants were tested for the presence of virus by 50% tissue culture infective dose (TCID50) titration, and cell monolayers were fixed and stained with the Panoptic Solution Kit® (Laborclin Ltda. Pinhais/PR, Brazil). Panoptic-stained monolayers were observed in a Zeiss-Observer D1 light microscope equipped with a Nomarski differential interferential contrast system. Cell viability was determined by incubating monolayers in a solution containing 5μg/mL Neutral red (diluted in PBS) for 3h at 37°C, in wells of 96-well plates. Then, the solution was discarded, and cells were incubated with 4% formaldehyde (in PBS) for 1min, and 100% methanol for 20min. Samples were analyzed by absorbance at 490nm, in an ELISA plate reader (SpectraMax M2). For transmission electron microscopy (TEM) analysis, treated and untreated monolayers in 25cm2 plastic culture flasks were fixed in 2.5% glutaraldehyde in 0.1M cacodylate buffer (pH 7.2), post-fixed for 1h in 1% OsO4/0.8% potassium ferrocyanide in the same buffer, dehydrated in ethanol and ‘flat-embedded’ in Polybed resin (Polysciences1), to preserve the cell architecture. Ultrathin sections (both routine, and en face) were stained with uranyl acetate and lead citrate and observed in a FEI Tecnai T20 transmission electron microscope. For the visualization of extracellular lamellae by TEM, 0.5mg/mL ruthenium red was added to the TEM fixation and post-fixation solutions (as well as to the intermediate washes in cacodylate buffer), and cells were processed for TEM as described above. This procedure was also performed during en face sectioning, in order to avoid removal of the cells from the substratum, which could disrupt and disorient their architecture. Treatment of BVDV-infected MDBK monolayers with PGA1 at concentrations of 0.1 and 0.5μg/mL reduced the virus yield in culture supernatants by 50%, and treatment with the highest concentration of PGA1 tested in this assay (5μg/mL) reduced the viral yield by 94% (Table 1). Thus, PGA1 treatment resulted in strong inhibition of BVDV replication in MDBK cells. Effect of prostaglandin A1 (PGA1) on bovine viral diarrhea virus (BVDV) replication in MDBK cells, expressed as the TCID50 and the percentage of replication inhibition. MDBK cells were infected with BVDV and treated with different concentrations of PGA1. The percentage of BVDV replication inhibition was calculated by measuring the virus yield in the supernatant of infected cells 36h after PGA1 treatment. While 1.0μg/mL PGA1 inhibited 50% of BDVD production, the highest concentration tested in this assay (5μg/mL PGA1) blocked replication by >90%. In light microscopy images, similar cytoplasmic alterations were observed in untreated and PGA1-treated cells (Fig. 1). Although treatment with 5μg/mL decreased by almost 2 logs the virus titration in the supernatant of infected cells (Table 1), vacuolization was not inhibited by PGA1 at this concentration (Fig. 1E). A reduction in vacuolization was only detectable when cells were treated with 10μg/mL PGA1 (Fig. 1F). At this concentration, treatment of MDBK cells with PGA1 for 36h did not result in cytotoxicity, as determined by microscopic examination or vital dye exclusion (data not shown). Light microscopy analysis of bovine viral diarrhea virus (BVDV) infected cells treated with prostaglandin A1 (PGA1). MDBK cells were treated with PGA1 for 36h, and then subjected to panoptic staining. 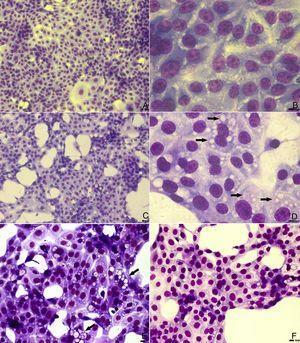 Low and high magnification images of untreated mock-infected cells (A, B), and of infected cells kept untreated (C, D) or treated with 5 (E) and 10 (F) μg/mL PGA1. Although 5μg/mL PGA1 strongly blocked BVDV replication (E), it did not inhibit the vacuolization process (arrows). Vacuolization inhibition was only achieved after treatment with 10μg/mL PGA1 (F). Scale bars: 8μm. The cytosolic vacuoles induced by BVDV infection were further investigated by transmission electron microscopy analysis (Fig. 2). BVDV infection induced a dramatic increase in vacuolar structures in MDBK cells (Fig. 2B). When viewed in both traditional and en face sections, many of the vesicles in infected cells were positive for ruthenium red and, thus, contained extracellular material (Fig. 2C and D). One of the main features that we observed in BVDV-infected cells was the presence of multilamellar structures inside vacuoles (Fig. 2C, E and F), while smaller vacuoles with internal vesicles surrounded those with multilamellar structures (Fig. 2E, F). Multilamellar structures were previously reported by Sanz-Sanchez and Risco, where they were linked to a cellular response to detachment from substratum due to bunyavirus infection.12 Despite the strong reduction in BVDV replication achieved by treatment with 5μg/mL PGA1 (Table 1), this PGA1 concentration did not prevent vacuolization in BVDV-infected cells (Fig. 1E). A strong reduction of virus-induced vacuolization was only achieved after treatment with 10μg/mL PGA1 (Fig. 2G). 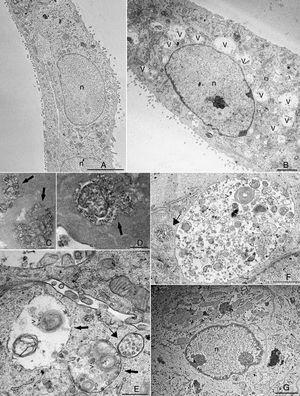 Transmission electron microscopy (TEM) analysis of bovine viral diarrhea virus (BVDV)-infected cells treated with prostaglandin A1 (PGA1). Infected and non-infected MDBK cells were treated with PGA1 for 36h, and then processed for routine TEM. Vacuoles (v) were rare or absent in the majority of sections from non-infected cells (A), but were abundant in BVDV-infected cells not treated with PGA1 (B). Many of these structures exhibited extracellular content, as shown by ruthenium red labeling (arrows) in traditional (C) and en face (D) sections. Treatment with 1μg/mL (E) or 2.5μg/mL (F) PGA1 could not prevent BVDV-induced vacuolization in infected cells, which had large vacuoles (arrows) with multilamellar structures (arrowheads), and often surrounded by smaller vesicles-containing vacuoles (thin arrows). (G) Treatment with 10g/mL PGA1, however, dramatically reduced virus-induced vacuolization. n, nucleus. Scale bars: (A) 5μm; (B, G) 2μm; (C, E) 500nm; (D, F) 1μm. The fact that treatment with 5μg/mL PGA1 inhibited BVDV production 94%, but did not block virus-induced vacuolization in host cells suggests that the vacuoles are, indeed, not involved in viral replication and that PGA1 probably reached its saturation point. Our data suggest that the antiviral activity of PGA1 is not associated with the inhibition of vacuole production, although the viral-induced vacuoles almost disappeared when higher concentrations of PGA1 were used. Our work shows that the antiviral activity of PGA1 during BVDV interaction with MDBK cells does not rely on a significant reduction in virus-induced cytoplasmic vacuolization, but in the viral titers reduction. Since the antiviral effects of PGs on BVDV had not been described, this is the first report of the parameters involved in the protection of MDBK cells from BVDV infection. This work was supported by Programa Nacional de Apoio ao Desenvolvimento da Metrologia, Qualidade e Tecnologia (Pronametro) and Coordenação de Aperfeiçoamento de Pessoal de Nível Superior (CAPES).